Spirella Designs: It is actually easier to show you the examples first. This is a string or thread art. We have recently added the Thread Store for you to purchase an assortment of Metallic Threads to use for your Designs. The store is at the bottom of the page and displays some beautiful Metallic Threads. 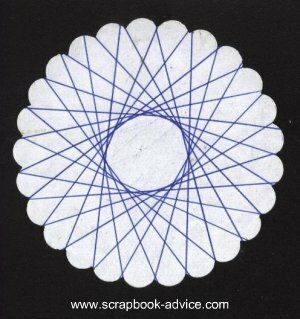 You may remember having a Spirograph that made these same type of circular images. 1. First you start with a design shape containing evenly spaced notches. This could be a Circle, Oval, Square, Rectangle, or Hexagon. 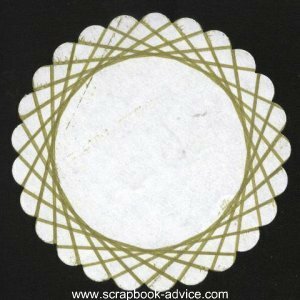 For this example, I have used a large Circle punch with scalloped edges. I have numbered the slots on the reverse side of the paper. Tip: Use a medium weight card stock or 2 pieces of text weight paper glued together. A little bit of extra weight will make wrapping the thread easier. 2. 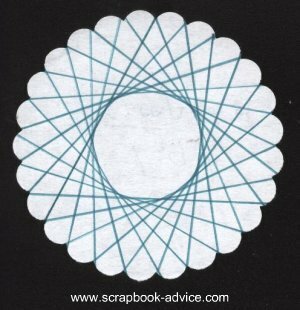 You then wrap thread or other cording around your design to form a pattern. To start, tape the beginning of the thread to the back of the card and pull it or wrap it up from the back to the front at slot #1 and then wrap it around to the back at slot #9. 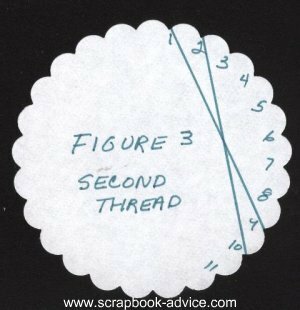 Spirella Designs Tip: I put some double sided adhesive on the back of the circle shape to hold not only the beginning thread, but some of the subsequent threads as they are wrapped. It just makes finishing easier. 3. 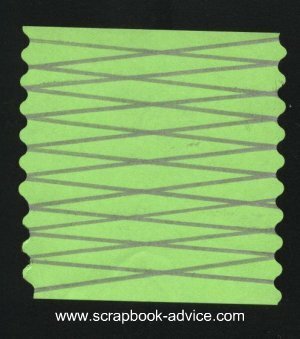 Then bring the thread up from the back of the card to the front at slot #2, and then wrap it around to the back at slot #10. Up to the front at slot #3 and then around to the back at slot #11. 4. Repeat this process, increasing or moving over one slot with each wrap of the thread. At the end, tape the thread to back of the card. You will actually use each of the slots twice. Once to wrap going to the back and once to wrap going to the front. Tip: When you have used all slots 2 times you are done. This particular design started with the thread being wrapped at 9 slots apart. Tip: Note that the farther apart your initial slots are, the smaller the circle that will be left in the middle of the design. Example: The gold Spirella Design was done using the same punch, but wrapping the cord every 6 slots. #1 to #6, #2 to #7, #3 to #8 and so on. The center is larger than the previous image, which was wrapped every 9 slots. Example: The blue Spirella was done using the same punch, but wrapping the cord every 11 slots. The center is smaller than each of the others using 6 and 9 slots apart. Since you can adjust the size of the center circle with your choice of the number of slots to skip when you wrap, try double wrapping with 2 colors of coordinating threads. This is a combination of 9 slots with the lighter green thread, and 6 slots of the darker green thread. The lighter thread was wrapped first, the darker thread wrapped second. This image has a lot more depth and dimension that the others which use only a single thread color. Don’t have a scalloped punch? 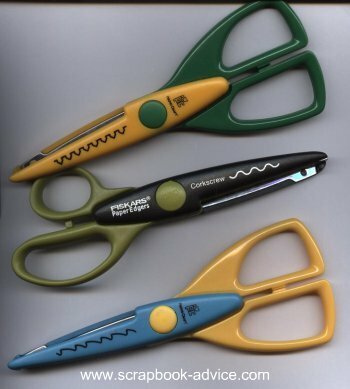 Try the Fiskars scissors or Decorative Scissors that cut a scalloped type edge or some type of cut that has a repeat uniform pattern. Here are 3 that I happen to have. If you look closely at the edge of each blade, the shape that each one cuts is shown. 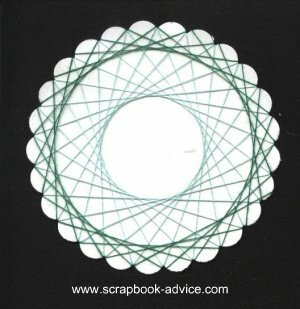 Example: The edge of these papers were cut with the scalloped scissors and all three will work for your Spirella Designs. 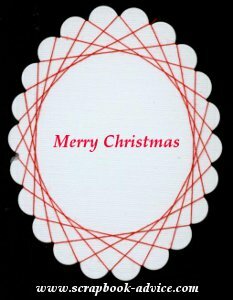 This card shows an example of cuts along two sides of a rectangle and what the threads would look like if you wrapped the thread across all the groves. When arriving at the end of the rectangle, go back in the other direction, again to wrap across every slot 2 times. Note there is no center area. 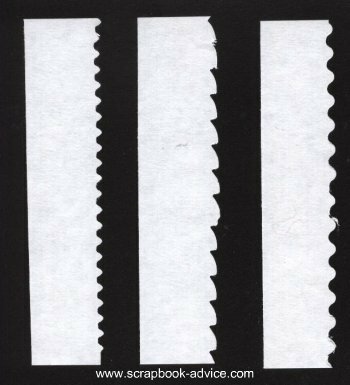 This Rectangle Spirella Design was made by wrapping the thread only on the outside 3 slots - around each of the four sides. The Square snowflake embellishment was adhered to the center of the square design. 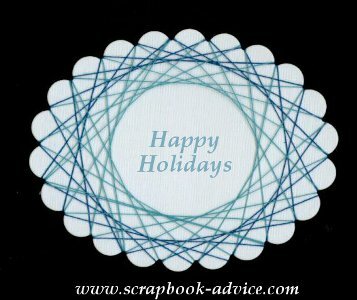 By choosing thread or cording colors like reds, greens, and golds, beautiful Christmas cards can be made using this technique. 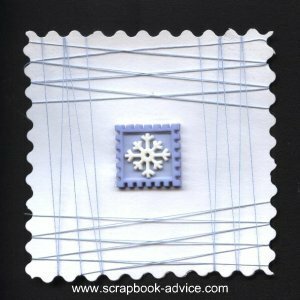 Blue, silver, gray and white cords would make great embellishments for Snow scrapbook layouts, or Hanukkah cards and layouts. Reds, oranges and yellows for Fall, Halloween or Thanksgiving cards and scrapbook layouts. These designs below are wrapped 3 times. Primary colors for New Years, Birthdays, School and Children's cards or scrapbook pages. Black, white, silver and gold for Celebrations such as New Year’s, Anniversaries, Retirements or Graduations. Pastels for Easter, Weddings and Baby Shower cards or invitations. Using wrap of colored metal wire, knitting yarn, narrow ribbons and raffia will add texture to the embellishment. Tip: The heavier the card stock the heavier weight material you can use for wrapping. If using thread, you can string seed beads onto the thread prior to wrapping. Count your slots and double that number to string the correct number of seeds beads. Every time the thread passes around a slot, slide a bead to the front side of the card. Add an embellishment to the center to fit the occasion of the card. Mini silk flowers, punched flowers, bows, buttons, brads even a rubber stamped image like these below. Both of these used Spellbinders Classic Ovals for the shape. They available for purchase below. Dry emboss the outside of the card around your Spirella Design image. 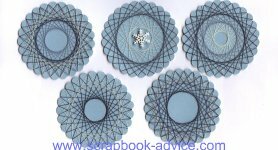 Here are a few Spellbinders options that would look great for your Spirella projects. SPELLBINDERS Wizard Nestabilities Dies. These dies feature cutting; embossing and stenciling capabilities. Each set of Dies nest in size approximately 1/4 inch larger than the previous die. These die will work with most diecutting systems. Available in a vast range of sizes and designs. Imported. SPELLBINDERSWizard Nestabilities Dies. These dies feature cutting; embossing and stenciling capabilities. Each set of Dies nest in size approximately 1/4in larger than the previous die. These die will work with most diecutting systems. Available in a vast range of sizes and designs. Imported. SPELLBINDERSWizard Nestabilities Dies. These dies feature cutting; embossing and stenciling capabilities. Each set of Dies nest in size approximately 1/4in larger than the previous die. These die will work with most diecutting systems. Spirella is easy to learn and no special supplies are needed. 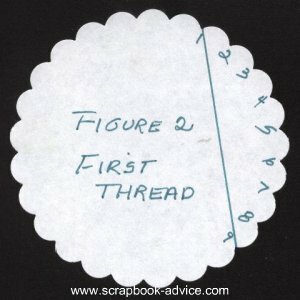 You can make your own templates and use papers and thread that you have on hand already. If you are interested in purchasing some ready made punches, nested punches, and die cuts to use for Spirella Designs in numerous shapes and colors, go to Ecstacy Crafts.com. Ecstacy Crafts makes the punches, in small, medium and large so you can layer or nest them. They also make die cuts to purchase in square, rectangle, triangle, snowflake, tree, bell shape, round, oval, and hexagon. I hope you were able to learn and enjoy this new technique. Have some fun with this idea. Play a little and make some now to go on future scrapbook layouts and greeting or holiday cards. Here in our Spirella Designs Thread Store, we have a selection of Metallic Threads in many beautiful shades as well as kits of various colors, so cruise through these and think about some Spirella embellishments to make your Holiday cards and Scrapbook Pages stunning.